When John Wesley died in 1791, many disputes arose within the Methodist leadership. One of the most contentious involved the three men whom Wesley had named as his literary executors: Thomas Coke (1747–1814), Henry Moore (1751–1844), and John Whitehead (c. 1740–1804). 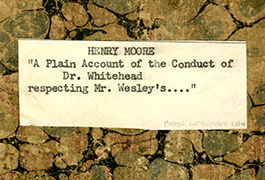 First it was agreed that Dr. Whitehead, Wesley’s physician, would write a biography of Wesley, with all profits dedicated to the charity fund for retired preachers. 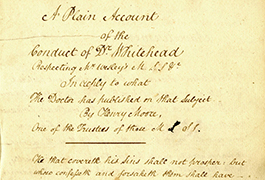 However, when Whitehead demanded unprecedented royalties and refused Coke and Moore access to Wesley’s papers, he was removed from his Methodist circuit. 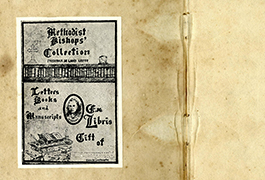 The first volume of Whitehead’s Life of the Rev. John Wesley appeared in 1793; the second in 1796. In the meantime, Coke and Moore had rushed to complete their one-volume “official” biography of Wesley in 1792. 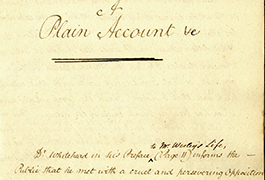 The exhibited manuscript is a transcription of Henry Moore’s argumentative account of the “biography controversy,” written circa 1797 and bearing a few of his own autograph corrections. 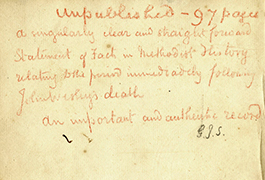 This controversial text remained unpublished until 1991, when Dr. Richard P. Heitzenrater edited the manuscript for publication in the catalogue of Bridwell Library’s exhibition “Faithful unto Death”: Last Years and Legacy of John Wesley. 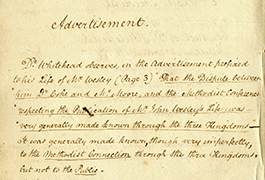 Additional information about this manuscript is available in the Early Methodists and Their Books digital exhibition on the Bridwell Library website. For more information on Henry Moore's Unpublished Manuscript at Bridwell Library, please contact Bridwell Library Special Collections.